The key to knowing how a reservoir or aquifer is performing is to monitor reservoir pressure variation with production. The pressure provides confirmation of the reserve in place and provides information on reservoir characteristics such as boundaries and storage-compressibility terms. In the petroleum industry it has been traditional to shut in wells periodically and to estimate the reservoir pressure based on the build-up characteristic. In the groundwater industry open observation wells have been used wherever possible. In the case of coal seam reservoirs it is not possible to shut in a well to get a meaningful reservoir pressure in reasonable time or without damaging the production characteristics. For this reason the use of separate monitoring wells is required. These are frequently the exploration core holes. 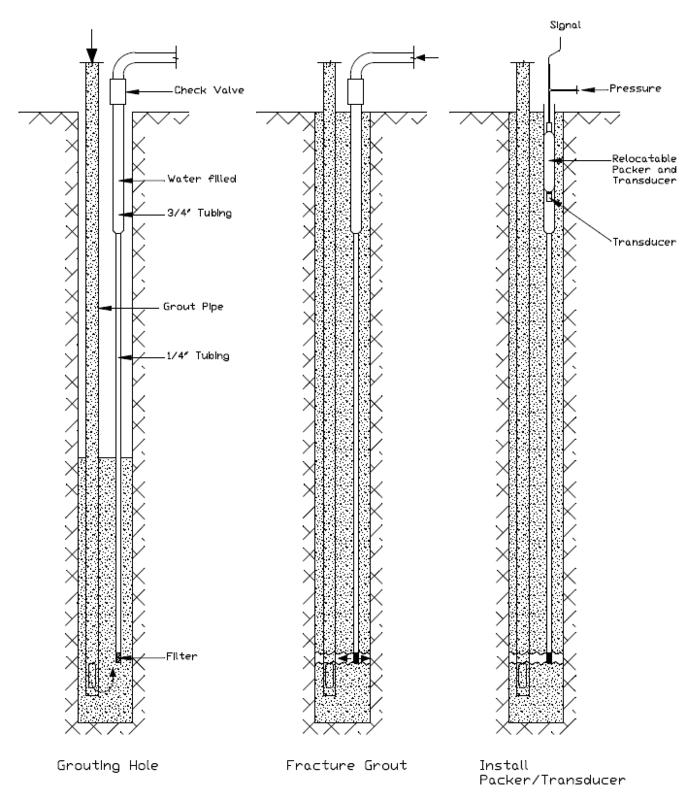 Fully cement grouted wells with transducers set in the cement on a pipe or casing. The traditional hydrogeological and civil engineering approach has been to use the sand and gravel packed zones containing transducers and sealed in between with bentonite clay and cement grout. The problem with such installations is the time required for their installation. Because of this there has been a shift towards transducers that are cemented into the well and the operation can be completed more quickly. Proper installation is however required to achieve success with this system especially in ensuring connection between the transducer and the formation. Sigra can install these systems and has some other variants in addition. One of these is the capability to measure pressure in boreholes that are drilled from underground in any orientation. This is useful for either groundwater or coal seam gas. All of these outputs are compatible with the Sigra Field Data Logger (qv) which has 24 bit sensitivity on frequency and vibrating wire applications, and 16 bit sensitivity for analogue inputs. We can obtain sensitivities of one part in a million with some transducers. The transducer types we supply for these applications are both vibrating wire and bridge type devices. We calibrate all the transducers we supply to traceable standards of pressure, and at a range of temperatures. We can therefore be certain of the accuracy and sensitivity of the devices that we supply. We can also supply transducers fitted to our range of packers for permanent monitoring single or multiple locations within a borehole (qv). Sigra uses its own transducers in cemented permanent reservoir monitoring applications (qv). Sigra has very sensitive low range vented pressure sensors for use in stream or surface reservoir monitoring (qv). These come in versions for 0.7, 3.5, 10 and 20 m water head. The use of a single packer and transducer to monitor pressure at the base of a borehole is a useful option for short term measurements. If the installation has to become permanent then it is usually desirable to cement grout on to the top of the packer. In this case Sigra can supply a multiple packer and transducer system that can be installed in the well. This ability comes from Sigra’s capability to manufacture packers, and electronics. Sometimes it is most convenient to monitor pressures in a cased, cemented and perforated casing. This would most likely be the case when the well is intended to be brought into production in the future but in the first instance can be used for monitoring. Sigra was asked to provide a system to monitor the pressure in a 1600 m deep aquifer over a period of some decades and to be able to guarantee the accuracy of the measurement over that period to 20 mm water head. This equates to a guaranteed accuracy of 12 ppm. As the aquifer was supposed to be relatively invariant in pressure the solution devised. This involved attaching a capillary tube with a larger pipe upper section to a cement grout (tremmie) pipe and to cement the hole. Then using the cement displacement technique a zone between the tip of the capillary tube and the aquifer was cleared by water injection and the cement allowed to set. The system could then be tested for connectivity between the aquifer and the capillary tube tip by injecting a small volume of water and watching the pressure decay. A small diameter packer with a precision low pressure transducer could then lowered to below the water surface within the pipe and set for monitoring to continue. The packer and transducer of this system can be removed in the event of failure or for recalibration. This is a simple but effective system. Periodically it is necessary to measure fluid pressures in an underground mine or tunnel. The reasons for undertaking such work are generally do determine the need for or effectiveness of mine drainage for water or gas. Sigra generally use two types of system for this purpose. 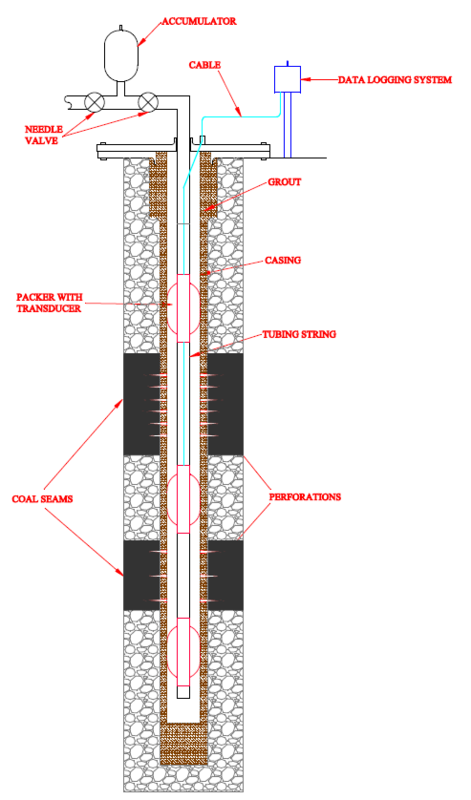 The first is packer based using single or multiple packers while the second is based on cementing (grouting) a hole and using the cement displacement techniques to connect capillary tubes to the hole collar. These may then be connected to pressure transducers or gauges. In addition to these similar techniques as adopted for surface holes may be used for holes that are inclined downwards. Figure 1 shows a multi-packer system used to monitor pressure in various sections of a borehole while Figure 2 shows the cemented (grouted) equivalent. Figure 3 shows a typical application where a central hole in a coal seam is fitted with a pressure sensing system such as that shown in Figure 1 or Figure 2 and has four flanking holes drilled parallel to it to for drainage. Figure 1.Multi-point packer system to monitor pressures in borehole. Figure 3.Typical use of multi-point pressure sensing to monitor drainage.